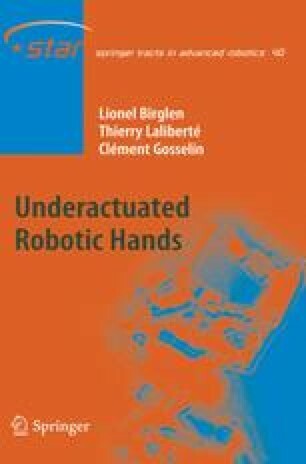 In this chapter, an introduction to the current state of the art of robotic hands and some background on the grasping/manipulation theory is proposed. Most robots are nowadays based on a serial architecture with six or seven axes that allow them to perform numerous tasks such as pick-and-place, camera inspection, or assembly. These robots can work in hazardous and/or hostile environments without putting human lives in jeopardy. Nevertheless, the dexterity of robots, i.e., their ability to perform highly precise operations with visual/perceptual/tactile feedback, has always been clearly more limited than that of a well-trained human being. To overcome this limitation, numerous research initiatives have been conducted in the past to create robotic end-effectors that can match the human hand in terms of performance and versatility. These devices have been referred to as robotic hands and many research laboratories around the world have developed prototypes of such hands as early as in the mid 1980’s when the foundations of these studies were laid (Mason and Salisbury 1985). However, the idea of copying the human hand is actually much older and may be contemporary of the first automata in the 18th century, e.g., La Musicienne of the inventor Jacquet-Droz (Rosheim 1994). This automate was able to play a wide variety of organ partitions with two five-finger hands actuated with steel cables connected to a programming cam shaft. More recent developments followed the first telemanipulators of the Argonne Laboratory, dedicated to nuclear material handling (Goertz 1952). This laboratory developed several mechanical gripping devices, or grippers, mostly based on a pinching motion of the jaws. However, each gripper was developed for a specific task, a drawback that still burdens the design of modern mechanical grippers.